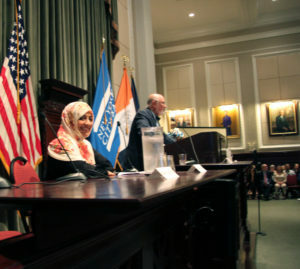 On 15 September, 2016, the Permanent Secretariat of the World Summit of Nobel Peace Laureates along with the New York City Bar Association and the Global Security Institute hosted a spectacular evening panel featuring three heroic female Nobel Peace Laureates, accompanied by an audience of high-level attorneys from the New York City area. 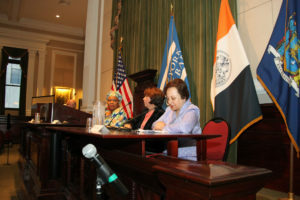 Held at the New York City Bar headquarters in Midtown Manhattan, the panel featured Nobel Peace Laureates Dr. Shirin Ebadi of Iran, Ms. Leymah Gbowee of Liberia, and Ms. Tawakkol Karman of Yemen. The session featured greetings from the President of the Permanent Secretariat, Ms. Ekaterina Zagladina, who also serves as a practicing attorney, as well as the Executive Director of the NYC Bar Mr. Bret Parker. 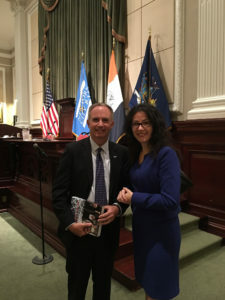 The panel was moderated by Mr. Jonathan Granoff, Executive Director of the Global Securities Institute, and international lawyer with expertise in nuclear weapons disarmament affairs. Each of the three laureates shared messages of wisdom and hope with the crowded room of high-level professionals. In addition, they provided tales of experience and proposed practical ideas for chartering a better future for all, including those who remain voiceless and underrepresented in our local and global societies. Dr. Shirin Ebadi was awarded the Nobel Peace Prize in 2003 for her courageous advocacy of democracy and human rights in Iran. She is an attorney and a former judge as well as the founder of the Defenders of Human Rights Center in Iran. After having been forced down from her position as judge following the rise of the Ayatollah, she and a team of lawyers offered pro-bono legal services for those who were being politically oppressed and unfairly prosecuted in Iran. 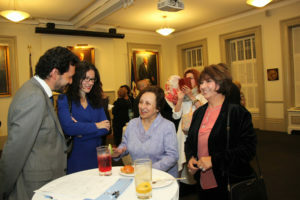 Living in exile from her home country, Dr. Ebadi encouraged the room full of attorneys in New York to honor their oath to implement justice while protecting the rights of others in doing so. 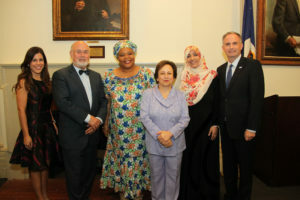 Ms. Leymah Gbowee was awarded the Nobel Peace Prize in 2011 for her inspiring leadership in organizing an interfaith women’s peace movement that was instrumental in ending a 14-year civil war in Liberia. The movement subsequently led to the nation’s first elected female president, Ms. Ellen Johnson Sirleaf. 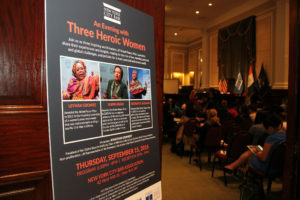 Through her remarks, Ms. Gbowee acknowledged that the world is in a very turbulent time today, and that it is not enough to just sit and talk about justice. Referencing American slavery Abolitionist Harriet Tubman, she encouraged the audience of lawyers to actively “walk for justice.” In doing so, she encouraged the audience to step out of their comfort zones to protect the rights of those that may not have the same rights and privileges as them. 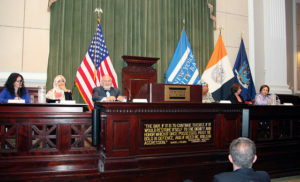 The Permanent Secretariat is grateful to Nobel Peace Laureates, the leadership of the New York City Bar Association, as well as those who attended the event.  The Permanent Secretariat would also like to extend its gratitude towards Mr. Jonathan Granoff for coordinating this opportunity.